On June 22, MAMAMOO made a comeback with its new album "Purple". In a word, it's awesome. 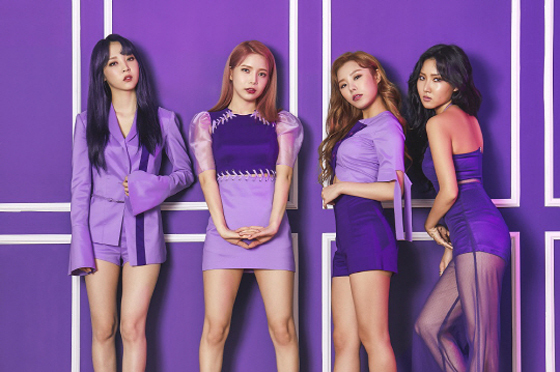 Purple is an unordinary color and is a color which is not for everyone, but the color represents MAMAMOO's distinct character. The girl group members, who have shown their pinky charm through their previous hit "Um Oh Ah Yeh" show more various colors this time. MAMAMOO's title track "Yes I am" reached the top of a variety of online music charts, while it's notable that the girl group beat various popular k-pop stars such as G-Dragon, BLACKPINK and Bolbbalgan. MAMAMOO was not a top class idol group just a year ago, but the team has been in a strong uptrend, and yeah, they did it. Through "Yes I am", a song which has catchy melody, MAMAMOO gives off its great energy. And the girl group shows very impressive energetic live performance too, while it's notable the song has lyrics that talk about the members. That's why many people can sympathize with the song. And "AZE Gag" is a very impressive song too. The song is comic, catchy and cheerful, while the MAMAMOO members show off their freewheeling charm through the song. You might not realize MAMAMOO's popularity because the girl group could seem not to have as many loyal fans as the other popular young and lovely girl groups. However, actually, the girl group is now enjoying huge popularity among men and women of all ages. The evidence of MAMAMOO's popularity? A total of 940,000 people listened to "Yes I am" on Melon for the first 24 hours after the release of the song, while it's a new record for a girl group. 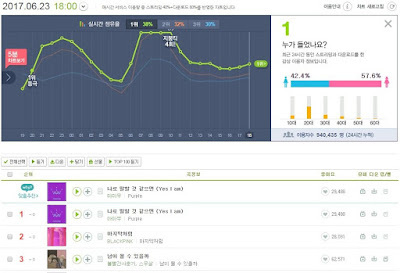 MAMAMOO beat Wonder Girls' previous record of 900,000. Basically, MAMAMOO could become one of the most popular k-pop girl groups because the girl group is totally different from the other girl groups. Most of k-pop girl groups just try to look pretty and lovely on the stage. However, MAMAMOO doesn't. Instead, the 4 members show how well they can sing and dance. They're not the prettiest idols, but they have outstanding singing ability, and they certainly know how to liven up the atmosphere. That's why MAMAMOO is the most sought-after girl group in the university festival season in Korea. Furthermore, as the members have a nice personality and are always nice to their fans, they have few anti fans. But that's not all. MAMAMOO has a great helper, Kim Do Hoon. You might not have heard of the name, but he is a very famous music producer. He is the CEO of MAMAMOO's agency, and yeah, he's like Park Jin Young of JYP Entertainment. Reason why he is not so famous among global k-pop fans is because he's never produced an idol group before MAMAMOO debuted in 2014. However, he is a very competent music producer, and he is the one who discovered the 4 talented MAMAMOO members, trained them and built up the girl group's distinct character. And the MAMAMOO members also take part in writing their songs, but basically, Kim Do Hoon writes all the songs. Of course, "Yes I am" is written by him too. People in the k-pop industry are now saying the MAMAMOO era has come. And they also say the era will continue for a long time for some reasons. First, the MAMAMOO members have great singing ability. Great singers can be loved by many people in any age. Second, MAMAMOO is not a girl group who just highlights its cute and lovely charm, which means the members will be able to be active as popular singers even after they became old. Third, SISTAR has disbanded, and there is no k-pop girl group who has a similar concept with MAMAMOO. You know, both SISTAR and MAMAMOO are girl groups who highlight their singing abilities rather than act cute on the stage, and it seems like there is no strong competitor who can stop MAMAMOO. K-pop Secret (Full Edition) is released! BTS: The K-pop Pioneer "Love yourself!"